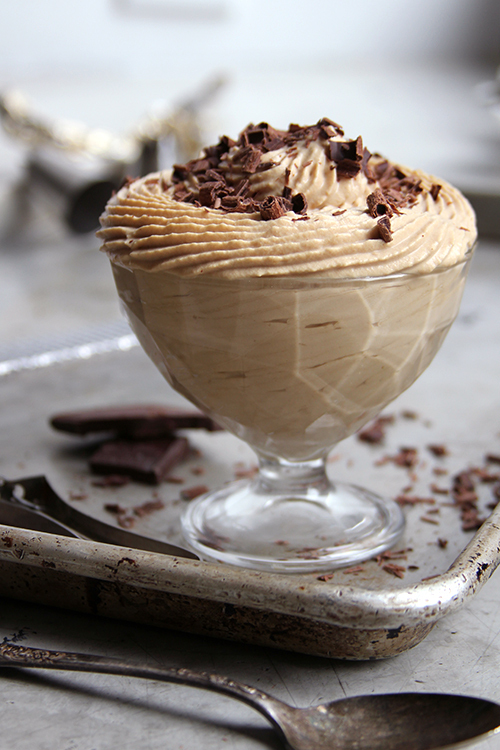 From Peter Salerno’s Kitchen: Ricotta and Coffee Mousse – Design Your Lifestyle. May 2014 May 2014 Peter Salerno, Inc. The amazing people at Saveur have done it again! At Peter Salerno Inc., we’re just crazy about this recipe. It’s a bold new take on a classic Italian dessert. You’ve probably had ricotta mousse (spuma di ricotta) if you love Italian desserts – but have you ever tried adding the flavor of coffee? The result is a stunning ricotta and coffee mousse (spuma di ricotta al caffe) that will leave your taste buds at a loss for words. Equal parts light and rich, sweet and savory, it’s the perfect compliment to a great meal or an amazing cup of coffee. Scroll down for this fantastic recipe, courtesy of Saveur! 1. Purée ricotta in a blender until smooth. Transfer to a large bowl; set aside. 2. Whip together heavy cream and sugar in a large bowl until soft peaks form. Set aside. 3. Bring ¼ cup water to a boil in a small saucepan; remove from heat. Whisk 2 tbsp. of the water with espresso in a small bowl. Whisk remaining water with gelatin in another small bowl until dissolved. 4. Stir espresso mixture into ricotta, then gelatin mixture; fold in cream in 3 stages. Chill mixture for 1 hour, then transfer to a pastry bag fitted with a star tip. Pipe mixture into 6 sundae glasses; refrigerate until set, about 1 hour. Garnish with shaved chocolate.